Tom Hampson preceded his Olympic title two years later by winning the first Commonwealth 880 yards gold in 1930. Although only the winners’ times were taken at the time, his 1:52.4 put him well clear of team-mate Reg Thomas. The 1950 event was more of a race as John Parlett won by 0.3 of a second in a rough, tactical event. England retained the title in 1954 with Derek Johnson leading home team-mate Brian Hewson with a Games record 1:50.7. Ian Boyd made it an English clean sweep. Johnson went on to win Olympic silver in 1956. Hewson was second again in 1958 and broke 1:50 but was behind unbeaten miler Herb Elliott, who ran 1:49.3 after a scorching 50.5-second last lap. The 1962 final was another won by one of the sport’s greatest. Olympic champion Peter Snell ran 1:47.6 but he was pushed all the way by Jamaican George Kerr. Kerr went even faster in the 1966 880 yards final in 1:47.2 but had to settle for third behind unfancied Aussie Noel Clough, who became the first man to run sub-1:47. Kenya won their first gold through Robert Ouko in the first 800m in 1970. It was the fastest two lap final but intrinsically slower over the slightly shorter distance. Kenya retained the title in 1974 as John Kipkurgat won in the second fastest time in history of 1:43.91. He was followed home by three quality athletes, Mike Boit, John Walker and Filbert Bayi. Boit won easily by a second in 1978 but Kenya had to settle for second in 1982 as Australia’s Peter Bourke, whose coach was Roger Bannister’s mentor, Franz Stampfl, ran a fast second lap. Chris McGeorge won Britain’s first medal in this event for 28 years. 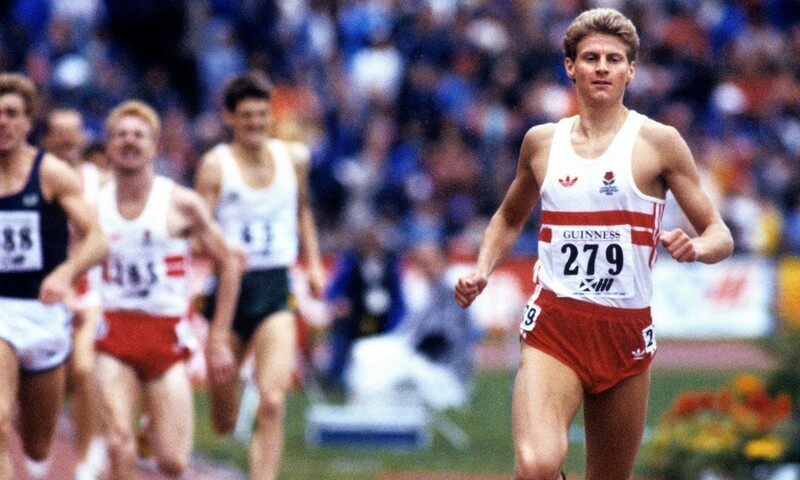 Amid a major boycott in 1986, Steve Cram (pictured) led Britain to a medal clean sweep in a Games record 1:43.22. Tom McKean smashed the Scottish record with 1:44.80 to take silver as eternal pacesetter Peter Elliott was third. An ill Seb Coe scratched from the final and he wasn’t fully fit in 1990 where he finished sixth and promptly retired. Sammy Tirop was a shock winner, just 0.02 ahead of Nixon Kiprotich as Matt Yates, who only squeezed into the England team, beat the then better-known names of Coe, McKean, Brian Whittle and Ikem Billy, and took bronze. Patrick Konchellah kept the title in Kenya with an easy win in 1994, as did Japheth Kimutai who won in a fast 1:43.82 after an extravagant 48.55 first lap. The 2006 final was a forgettable contest won by Alex Kipchirchir. The 2010 race was more notable only in that Kenya won the eighth of the ten 800m titles they had contested. That was despite missing some of their best athletes as Boaz Lalang led a medal sweep. Most successful athlete: Boit with a gold and silver. Most successful Briton: Hewson is the only double medallist with two silvers.